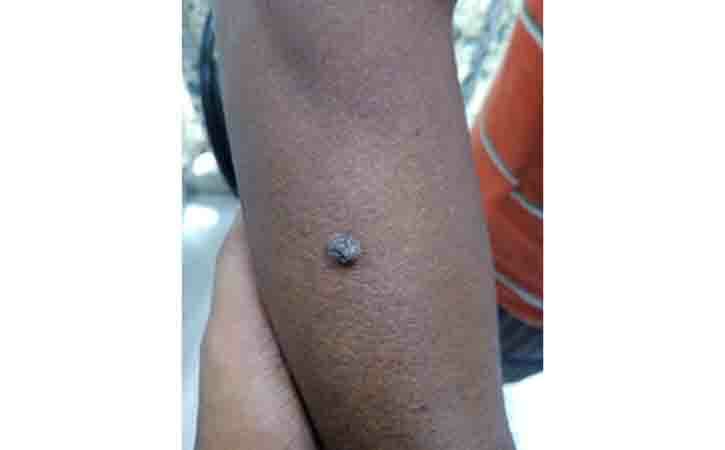 Seborrhoeic warts are also known as seborrhoeic keratosis and as basal cell papillomas. The term ‘senile wart’ has now been dropped as it offended many patients. Seborrhoeic warts are harmless growths on the skin, which are very common in the elderly. They are benign growths due to a buildup of ordinary skin cells. Seborrhoeic warts are the most common benign tumor in older individuals. Seborrhoeic warts have a variety of clinical appearances and they develop from the proliferation of epidermal cells. No specific etiologic factors have been identified. Once they have developed, seborrhoeic warts usually remain for life and new ones may appear over the years. They can vary in number, from one or two to hundreds. They are much more common than skin cancers and are usually easy to recognise. They seem to be most common in Caucasians, but similar lesions are seen in black-skinned and Asian peoples. Seborrhoeic warts are harmless, but can be a considerable nuisance. They can itch, become inflamed, and catch on clothing. Many people dislike the look of them, particularly when they come up on the face. Despite their name, seborrhoeic warts are nothing to do with sebaceous glands or viral warts. They are benign growths due to a buildup of ordinary skin cells. They are strongly age-related. They usually start to appear after the age of 40 years, and most old people will have at least a few seborrhoeic warts, some will have large numbers. They are not infectious and do not become malignant. Usually 0·5–3·0 cm in diameter. 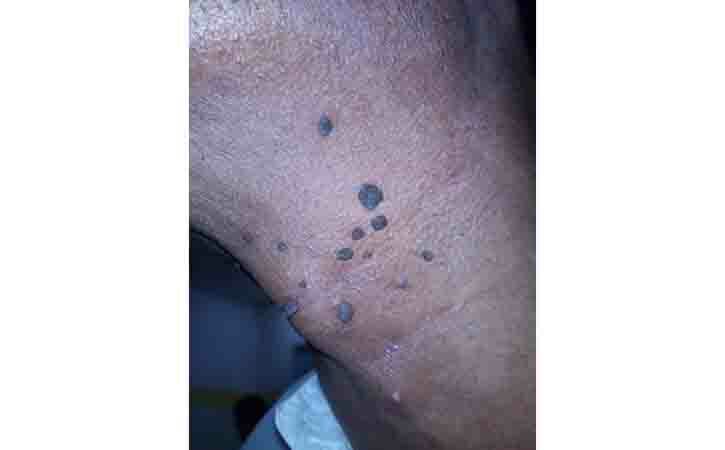 Seborrheic warts are thought to result from a clonal expansion of a mutated epidermal keratinocyte. Some cases are inherited through an autosomal dominant mode of inheritance. Sunlight seems to play a role in the development of some seborrheic warts. Evidence indicates that at least some seborrheic warts have a clonal nature. Activating mutations in the gene encoding the tyrosine kinase receptor FGFR3 have been found in 85% of adenoid seborrheic warts. Seborrhoeic warts are so common that it would be impossible to treat them all routinely. Most need no treatment anyway – people accept them as a harmless accompaniment of getting older. Ammonium lactate and alpha hydroxy acids have been reported to reduce the height of seborrheic warts. Superficial lesions can be treated by carefully applying pure trichloroacetic acid and repeating if the full thickness is not removed on the first treatment. Topical treatment with tazarotene cream 0.1% applied twice daily for 16 weeks caused clinical improvement in seborrheic warts in 7 of 15 patients. Seborrhoeic warts do not require treatment, as they are usually harmless, but may want them to be removed for cosmetic reasons. A variety of techniques may be used to treat seborrheic warts. They include cryotherapy with carbon dioxide (dry ice) or liquid nitrogen, electrodesiccation, electrodesiccation and curettage, curettage alone, shave biopsy or excision using a scalpel, or a laser or dermabrasion surgery. Some of these techniques destroy the lesion without providing a specimen for histopathologic diagnosis. The shave biopsy provides histologic material for accurate diagnosis and removes the lesion in a cosmetically acceptable manner at the same time. After a shave biopsy is obtained, a curette can be employed to smooth and remove any remaining keratotic material. If a biopsy is not desired, light electrodesiccation facilitates a sharp curettage. Freezing seborrheic warts with dry ice or liquid nitrogen avoids the need for surgical excision. Complications of freezing include pigmentary changes and on occasion, scarring. Curettage in conjunction with liquid nitrogen generally gives better results than liquid nitrogen alone. Application of 70% glycolic acid for 3-5 minutes prior to curetting also is effective. Always contact a doctor if worried about a pigmented spot that is changing in any way. Seborrheic warts are much more common than skin cancers and are usually easy to recognise. It is important to get any new, unusually coloured lump checked over by a doctor, so that the correct diagnosis can be made. In cosmetic purpose, need to contact a dermatologist for surgical removal.